My favorite part about living in Paris was walking through the streets and discovering the most beautiful boulangerie and patisserie windows with their baguettes, croissants and decadent pastries. While I could indulge in the world’s finest breads pastries, my husband with celiac disease had to stick to macaroons! In 2010, the words “sans gluten” were foreign to restaurant and bakery owners. The concept of pastry without the gluten was unthinkable. And yet, 6 years later, gluten free has taken hold. In Paris, you can now find bakeries selling gluten-free breads, sandwiches and pastries. 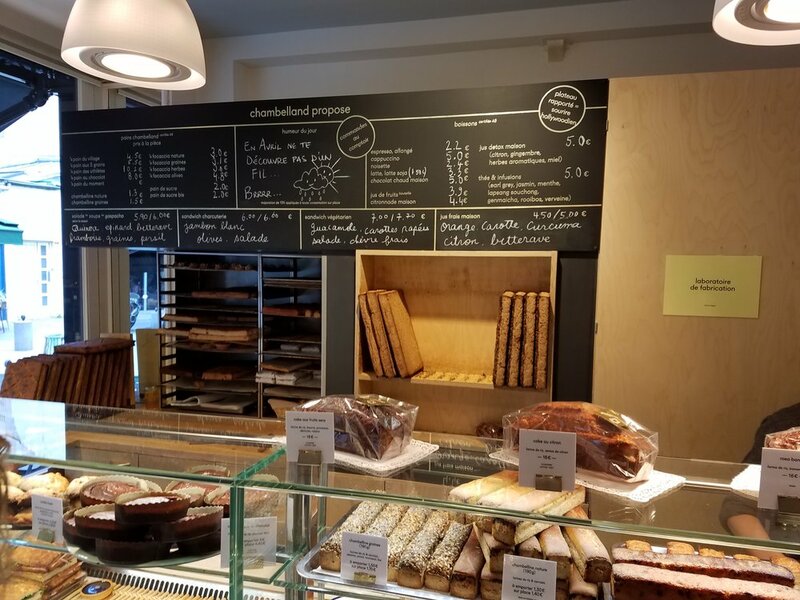 The city’s gluten-free dedicated gluten free bakery is Helmut Newcake, a pastry shop less than a 10-minute walk from the Galeries Lafayette and Printemps in the Ninth Arrondissement. The display windows at Helmut Newcake are stacked with delicate fruit tarts and cream filled éclairs, typical of the traditional boulangerie. 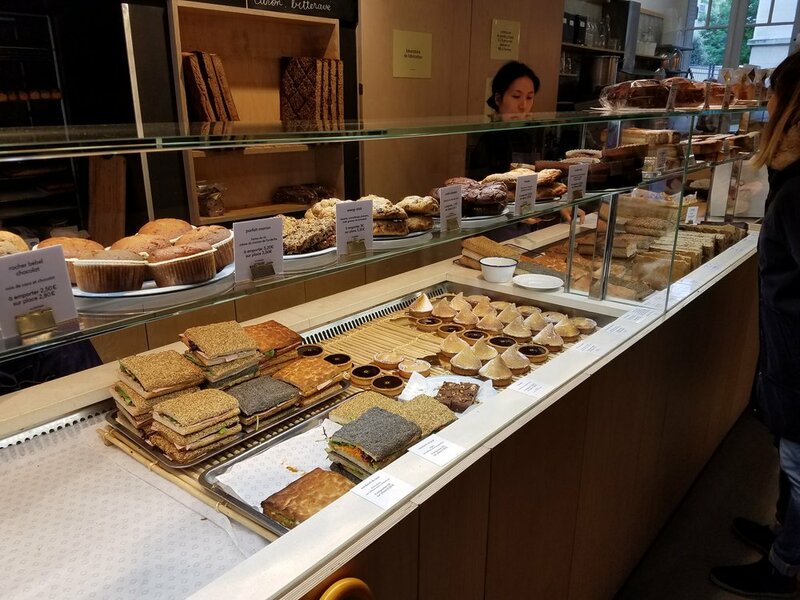 Not far from Helmut Newcake, near the Louvre, the famed French baker Eric Kayser, too, has gluten-free offerings on the Rue de l’Échelle. Since Eric Kayser is not a dedicated gluten free bakery like the others, they pre-wrap all of the gluten free offerings. The cellophane wrapped cakes and cookies appear un-appealing in the case, especially compared to their neighboring fresh regular bread and pastry options. There is a separate area dedicated to various types of gluten free breads including chickpea bread, buckwheat bread, and multi-grain bread. We bought one of each loaf to try. To be frank, I didn't like the gluten free bread at Eric Kayser as much as I hoped I would. The loaves were dense and heavy. But it's so fun to be able to purchase gluten free treats at one of Paris's most well established bakeries! You can also find artisanal leavened breads made with flours like rice and buckwheat at Chambelland in the 11th Arrondissement. At Chambelland, as at La Maison Kayser and Helmut Newcake, they don’t use the food-grade preservatives that are the norm in North American gluten-free products. We sat outside the very crowded restaurant and enjoyed the most delicious lunch. There are a select number of sandwiches offered daily and once they are sold out, they don't make more. We finished eating at 12:30 and two out of the three sandwich options were already sold out! Josh and I shared the tomato, basil and mozzarella sandwich and the tuna sandwich on a large fresh focaccia. 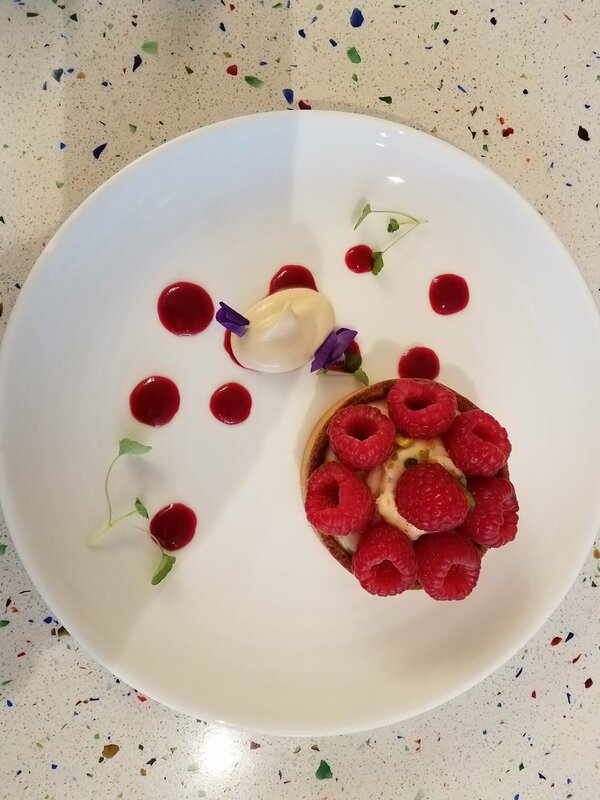 We could not resist tasting the raspberry tart for dessert. It tasted as beautiful as it looked in the bakery case. We loved Chambelland so much that we went back the next day again! We bought a loaf of Chambelland’s pain aux cinq grains (the five grains being buckwheat, sunflower, gold and brown flax, poppy seed and sesame) to eat at our hotel breakfast. Most Paris hotels still don't offer gluten free bread at breakfast. We can't expect them to progress that quickly! Chambelland was the first restaurant we came back to on our trip back to Paris. It was a rainy cold day, but we made it our mission to make the trip back, despite its non central location. 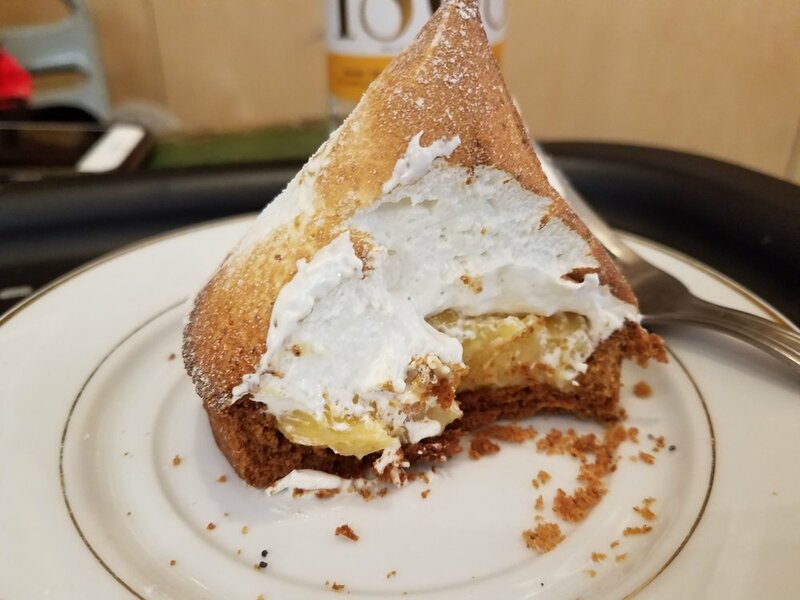 We were most excited to eat that amazing bread that we remembered so fondly, and the lemon meringue tarte made with the creamiest richest French meringue you have ever tasted in your life. We actually got a seat inside this time- usually this place is PACKED around lunch. They haven't changed much since we went two years ago, but the food was just as consistently delicious as we remembered. All of the breads resemble a focaccia shape but made with different ancient grains, rice flour and seeds. We took four different types of breads home with us to try. It's most exciting that they bake all of their breads in the back of the restaurant, as many of the other gluten free bakeries that we went to purchase their bread from a supplier. Nothing like fresh (gluten free) bread in Paris! NOGlue is an entirely gluten free restaurant featuring French cuisine. Located in an alleyway in the 7th arrondissement, they are open for dinner only and require reservations in advance. The space is tiny, so they fill up quite quickly. If you can't make it to the restaurant, be sure to stop by the take-away bakery just across the way. We stopped their for an afternoon snack when the restaurant was closed. The tomato and mozzarella panini was just delicious! We went to have lunch at a new NoGlue location near Le Marais, which was a nice sit down restaurant. It seemed like every patron in the restaurant was American. Even the servers preferred to speak English to French. This was very illustrative of their main customer base. As I always say, the French are very negative on gluten free, since baguettes and croissants are part of their underlying culture. We ordered gluten free fish and chips, spinach and goats cheese quiche, and raspberry tarte for dessert. The fish and chips were nothing to write home about. The quiche was absolutely phenomenal! It's hard to get the same flaky crust without the gluten but the buttery flavor was delicious. The tarte was very impressive- similar to the quiche crust. The presentation of the tarte made it all the more delicious. Bears and Raccoons is a new gluten free cafe since the last time we visited Paris 2 years ago. 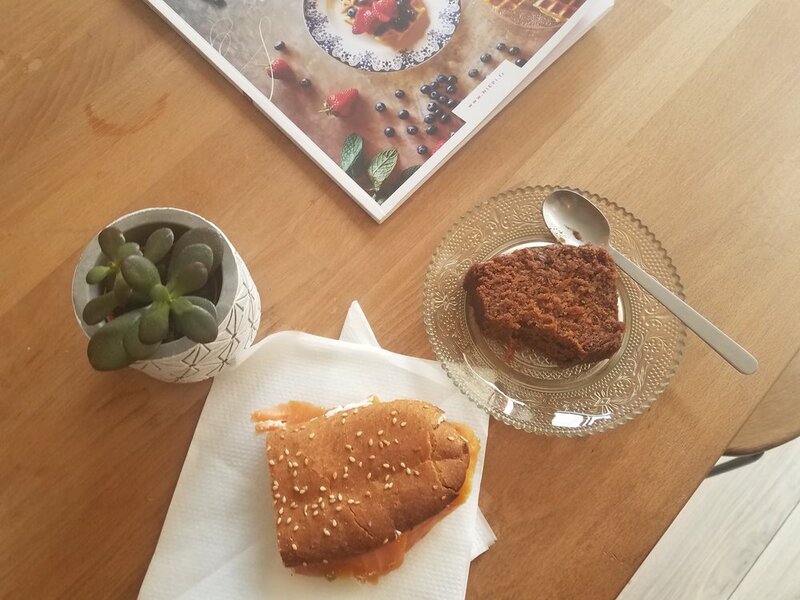 A dedicated gluten free cafe that offers sandwiches, cakes, cookies and organic coffees and teas. They don't offer classic French patisserie like Chambelland and NoGlue (tarts, eclairs, chouquete) but they have a nice selection of sweets including carrot cake, brownies, and chocolate chip cookies. Not your genuine Parisian culinary experience, but a cute spot to sit for lunch. They don't make their bread in house, and the sandwiches were just ok. The carrot cake was moist and very delicious. The Grande Epicerie is the most grandiose multi level food and beverage hall that I have ever witnessed. The store is so beautifully merchandised that it makes you want to buy and eat everything. There are foods from around the world and all different types of cuisines. The almond croissants are the best I have ever tasted in my life. I was excited to see that since I've last visited Le Grande Epicerie, they have added an entire gluten free section next to the bakery with packaged breads, pastries and cookies. We bought a loaf of bread seeded bread to eat with some truffled goats cheese at the cheese and wine bar and it was pretty impressive! Everything is pre-packaged so you can make sure there is no cross contamination. Le Marais is filled with trendy and creative food concepts. 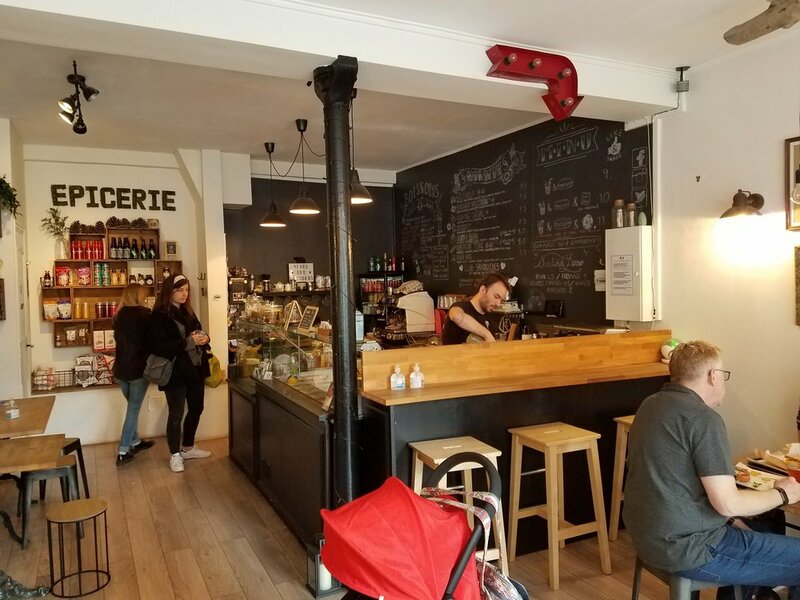 If you have any dietary restrictions, you can bet that there will be food for you in Le Marais. 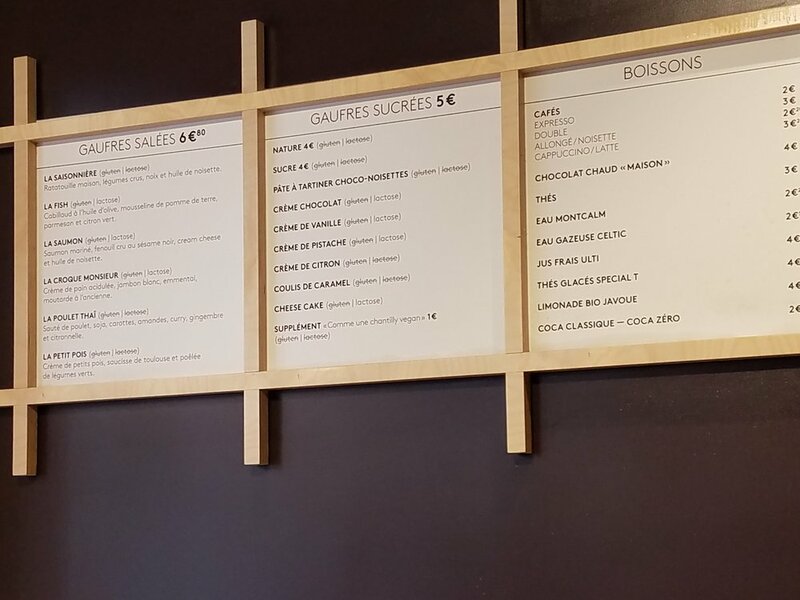 One of the new gluten free and vegan concepts in Le Marais is Yummy & Guilt Free Gaufres. Gaufres means waffles in French. The waffles are vegan and gluten free. There are sweet and savory options- similar to the French sweet and savory crepes. 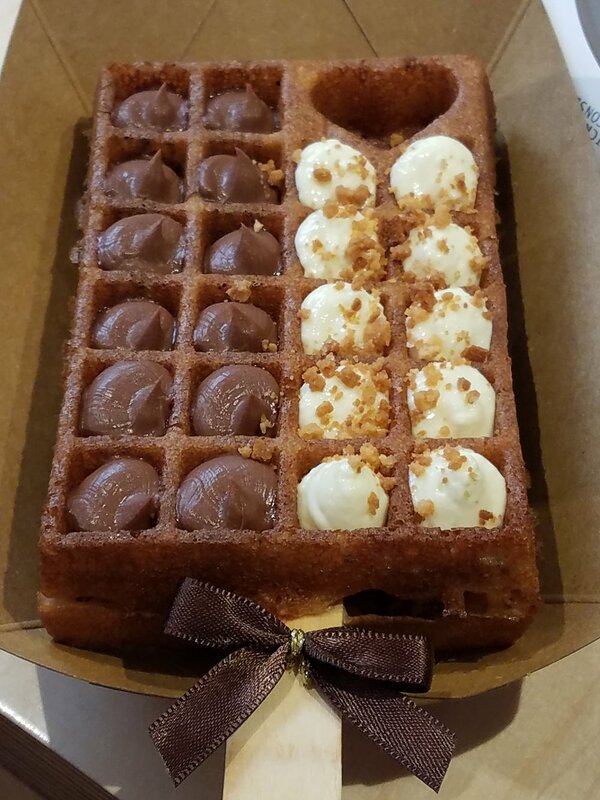 You can choose your own fillings and watch them hand pipe the fillings into the waffles in front of you. The place is very tiny with only a few tables, but it's more of a quick fix take away type of place. The gaufres are light and delicious. It's hard to stop at just one! Chapon is another concept eatery in Le Marais. This is the first chocolate mousse and toppings bar that I have ever seen. Choose your mousse base and then choose your toppings. Served either in a cone or a cup. The entire menu is vegan and they also have a gluten free patty and gluten free bun. Their vegan and gluten free burgers are delicious! Choose from an interesting mix of flavors and variety of toppings and accompaniments. I would highly recommend it for anyone who is vegetarian or gluten free! Most customers in the restaurant sounded American. Even the guys at the counter spoke English perfectly with no French accent. Le Marais is filled with lots of x-pats since it has turned into such a trendy and "yuppy" area.